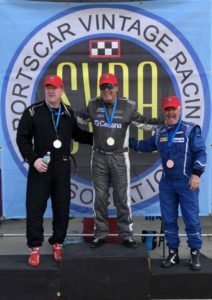 Group 10 SC winners in the SVRA Sebring Vintage Classic. SEBRING, Fla. (March 3, 2019) –ATF & Gunslinger put historic trucks back in action this weekend, as they took on their first weekend of Sportscar Vintage Racing Association (SVRA) competition at Sebring (Fla.) International Raceway. NASCAR Gander Outdoors Truck Series (NGOTS) champion Mike Skinner drove the team to victory in back-to-back wins, while earning the overall class win in each of the weekend’s two Group 10 feature races.